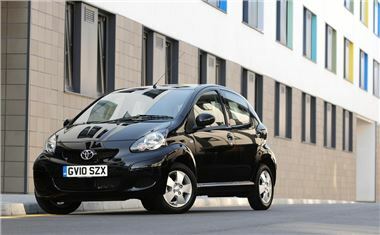 A new range-topping Aygo model has been launched by Toyota. The Aygo Black comes with extra equipment, metallic black paint and is available with a year's free insurance. Leather and Alcantara upholstery are fitted as standard to the Aygo Black, along with a sports steering wheel and 14 in alloy wheels. Power comes from the Aygo's usual 1.0-litre petrol engine coupled to a five-speed manual gearbox. Three- and five-door versions of the Aygo Black are on offer and available to order now with prices starting at £9460. Toyota's Multimode automatic transmission is also an option on five-door versions equipped with air conditioning. A year's free insurance from Toyota is also on offer for a limited period, though buyers must be 21-years old or over.